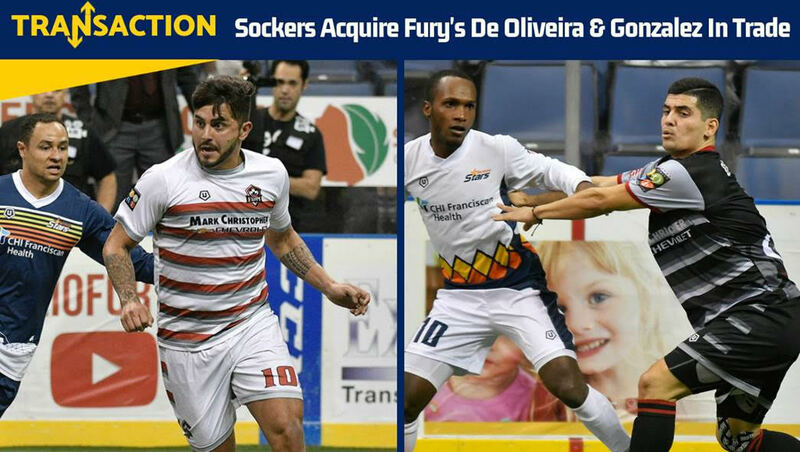 SAN DIEGO (Wednesday, November 14, 2018 – #18-21) – The 14-time champion San Diego Sockers have agreed to a four-player trade with the Ontario Fury, acquiring forward Leonardo De Oliveira and defender Juan Gonzalez from Ontario in exchange for goalkeeper Chris Toth and forward Andy Lorei. San Diego bolsters its offensive attack with the addition of De Oliveira and Gonzalez, as the pair combined to produce 20 goals and 21 assists last year for Ontario. De Oliveira, who is in his fourth MASL season, notched his best statistical campaign in 2016-17 with 31 goals and 20 assists (51 points). In 2017-18, De Oliveira scored 13-15=28 points in 13 games played. In 50 career games with Detroit and Ontario, De Oliveira has recorded 57-55=112 points. Gonzalez, who is the identical twin of former Socker Felipe, notched 7-6=13 points in 22 games last season with Ontario. During his seven-year career, he has scored 29-26=55 points with the Anaheim Bolts, Las Vegas Legends, Turlock Express and Fury. With the departure of Toth, the 2017-18 MASL goals-against average leader Boris Pardo will assume the role of the number one goalkeeper for San Diego. “Having the two best goalkeepers in the MASL was an unprecedented luxury, however it was time to move forward with Boris as our starting goalkeeper. His skills and resume speak for themselves giving us the confidence with our decision,” stated Bowers. The Sockers begin their 40th anniversary season on Sunday, December 16 at 5:05 p.m. against Rio Grande Valley at Valley View Casino Center. Season Supporter Memberships, group, and single game tickets are on sale now by calling 866-799-GOAL (4625) by visiting Sockers.com or AXS.com (Search: Sockers).